After a long period off the bike I was fired with renewed enthusiasm after my recent attempt at the Maratona dles Dolomites and a daily dose of Tour de France consumption. 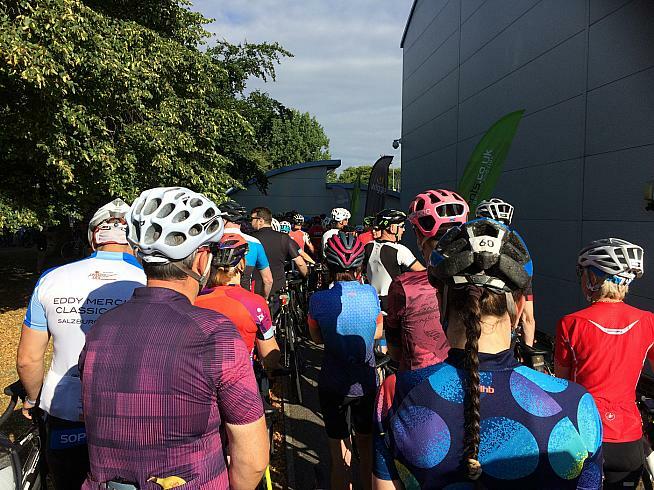 I wanted to get a century under my belt again after almost two years and the Wiggle Mendips sportive looked the perfect event to continue my rehabilitation. Well, it wasn't quite a century - the "Epic" course was 96 miles - but that was near enough, and the last 34 miles looked pan flat for an easy run in. Living just outside Bristol the three major climbs were also well known to me from previous training rides - up the hill to Priddy, Burrington Combe and Cheddar Gorge. The parcours looked more or less the same as when I cycled the same event two or three years ago. The weather was going to be another dry and sunny day in this long, hot summer. Everything looked in place. Paul rode the epic course taking in three of the Mendips' iconic climbs. There are numerous jumping off points to access the Mendips Hills but I imagine not so many with the requisite facilities and parking space for an event of this size. The base for the sportive was once again at Strode College Sport Centre in Street near Glastonbury. The venue opened at 7.20am on Sunday 22nd July. Registration then commenced from 7.30am. In previous years my strategy for sportives had been to linger in bed as long as possible and then turn up right before the cut-off time for the start. This had two benefits: (a) more sleep and (b) no queue to sign on. However, over time I realised there were potential more pitfalls: (1) less desirable parking spot (2) no one else to ride with (3) only crumbs left at feed stations or worse feed station had packed up (4) everything packed up at the finish (5) an irate Mrs Hunt waiting for me to take over childcare duties so she could go and play badminton. After making a list of pros and cons I resolved for a change in tack and aimed for an early arrival. My best laid plans were partly realised, although I wasn't banging on the gate at 7.20am. I did arrive around 7.45am along with a lot of others, although the vehicles were moving steadily onto the college playing field which was deputising as the car park. In order to get to said playing field there was a bit of an obstacle course through the college grounds which involved manoeuvring between a picnic bench and a metal post with only inches to spare. Once parked up I wanted to get on the road as soon as possible. Riders on the Epic course could set off between 7.45-8.30am. Those on the 63 mile Standard course were scheduled to start from 8.15-8.45am. I got ready and wheeled my bike the short distance to the registration in the sports hall. However, on the way I encountered the queue for the start which was snaking back around the building in an S shape and looked particularly long. The layout of the building the queue was formed against meant that only those at the very front could actually see the start pen. In addition, everyone registering had to try and get through the queue to get to the hall. Queues at the start line were the only minor hassle on a great day's cycling. I leaned my bike up against a wall and got through to the hall. "No cleats" read the sign so it was shoes off and I padded in. Thankfully, the massive hall was nearly empty and I was registered in no time. I signed my name and received the usual sticker on my bike helmet for timing purposes and a number and cable ties for the handlebars with an emergency number on the back. Once back out of the hall I went back through the queue to the toilet block opposite. There was six people ahead of me for one cubicle. I decided to leave it, in favour of joining the ever-lengthening start queue, and take my chances out on the road. It was sometime after 8am when I got in the queue and I assume it must have been peak time. I had plenty of opportunity to talk to the two people next to me, a lad from Cardiff and Dr Claire from Swansea. They reminisced about the 30 degree plus temperatures at the recent Velothon Wales. As we conversed the queue occasionally inched forward with long periods of being static in between. It was only when we inched around the corner that we could see the start. Then a bit further forward one of the organisers was asking if anyone was doing the Epic rather than the Standard distance. Our hands went up and we were extracted from the main queue to a short cut that looped round to the start. After a short briefing we were off. I reckon I had been in the queue for around thirty minutes. In hindsight it was probably the peak time for both Epic and Standard riders to get on the road. However, the situation could have been improved if one of the organisers had gone down the line and separated out the Epic riders to the front rather than that only being achieved right by the Start line. The whole premises seemed a bit cramped at that point to deal with the numbers who had turned up to ride. The combination of frustration at waiting and then the sudden burst of energy from being on the road resulted in the majority of my group immediately going the wrong way at the first turning. We realised after about 30 metres and sheepishly turned tail back onto the course. The signage was not really to blame and the route was clearly and frequently signposted all day with white arrows on an orange background. The Epic route had 5095 feet / 1553m of climbing (Wiggle rating 8/10), Standard 3106 feet / 947m (7/10) and there was also a short 34-mile route with 731 feet / 223m (5/10) that set off from 8.45-9am. I couldn't get the GPX file to download from the pre-event briefing email so went for the Garmin file instead. It was easily accessible but did not show the route profile. The initial roads were flat although many of them had had a fair camber from the middle and so you had to pay attention. The Short route turned off before the climb around the 10 mile mark. After 12 miles we were at the foot of the Mendip Hills for the climb up to Priddy. I realised too late that there was a problem with my gears slipping and the chain would not stay in the bottom gear. I knew the climb had a few steep sections. It was also quite narrow, to the extent that passing cars have disrupted my rhythm on previous ascents. However, on this occasion there were only two cars early on and I was able to dig in with the gearing I did have. There were some short sections of 14-16% but the overall average was less than half of that. At the top of the climb I bumped into Dr Claire again and we continued along the top of the Mendips through Priddy aiming for the first feed station after 29 miles. The route split between the Standard and Epic came just before the 20 mile point. 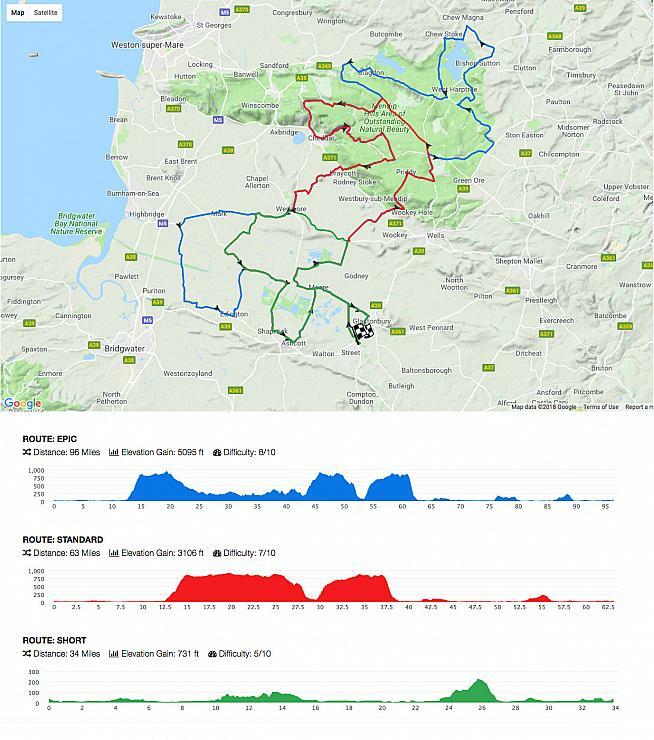 A late amendment to the pre-event briefing had also highlighted that a bicycle race was taking place on the same day on a loop route at the top of the Mendips. We had been advised to make it to the 21 mile mark before 10.30am in order to avoid being held up by the race marshalls. I had thought that this would be no problem but with the delayed start I was a bit more concerned. In the event we made it with 30 minutes to spare. At the feed station at Bishop Sutton Village Hall Dr Claire and I went our separate ways. The resident mechanic sorted my gearing out in five minutes and it was perfect for the rest of the ride. Stourbridge riders deep in fuelling strategy calculations at the feed stop. Since I last rode a Wiggle event one major change is that all the sponsored fuelling products are now provided by Science in Sport. 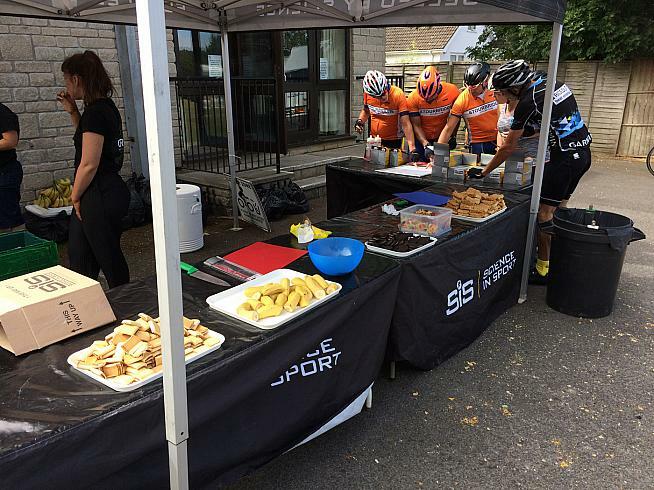 Each rider was allowed one gel or energy bar at each feed station. There was also SiS energy drink along with water and a variety of other food including flapjacks, bananas and jelly beans. The next part of the route was deceptively rolling terrain where I had thought it would be a bit flatter. There was a picturesque section around Chew Valley Lake before I arrived at the foot of Burrington Combe at around 42 miles. This is a climb I have done several times. It is about 6km long with the odd 14-16% short section but generally it is about maintaining a rhythm to the top over a fairly consistent 5-6 % gradient. Whether it was the heat or some other factor at play I don't know, but I didn't feel good on the climb and needed a rest at the top. However, a post-ride peek at Strava showed my best ever time - very strange. At the top I chatted to a rider from Scotland who had come down to the area on holiday partly to ride the event. After winding down to Cheddar he stopped to take some photos whilst I went on to tackle the Gorge. The steep 16% section at the bottom felt steeper than ever before, but the majority of the ascent after that is quite shallow with an overall 4% average gradient. No PB here, and again there was a danger of bumping into the cycling race at the top but I saw nothing. After a bit more riding along the top of the hills there was a really steep sustained descent before the second feed station. Near the bottom of the descent I saw a female rider pushing her bike. Further enquiries revealed that there had been a minor incident where she had unexpectedly met a car coming the other way and it had shaken her up a bit. She must have just been regaining her composure as she rolled into the second feed station at Draycott Memorial Hall a short time later. The feed station was at 62 miles and it was all relatively flat from here. I was back out on my own but then two ill- considered factors hit me. I had neglected to account for the sustained headwind, and also my own fitness level. In short I was struggling. Salvation arrived in the form of the lady rider from the descent and her friend who rode past me. I managed to gather myself to hang onto the back of them both until the final feed station after 82 miles at Burtle Village Hall. They didn't linger long at Burtle, but I needed to regroup so I thanked them and braced myself for the last 14 miles. It felt like forever but I finally made it back to the finish in just over eight hours. After crossing the line I received a medal, an SiS protein bar, a headscarf and an orange pair of Wiggle cycling socks. By chance the socks are a perfect match for my Maratona cycling jersey. Overall, there was satisfaction in completing my longest ride in almost two years and another professionally run sportive by UK Cycling Events. The only area for improvement was the start line fiasco and getting riders on the road at the peak time of demand. A little more coordination could have made that smoother, but every other aspect was perfect and resulted in a great day on the bike. 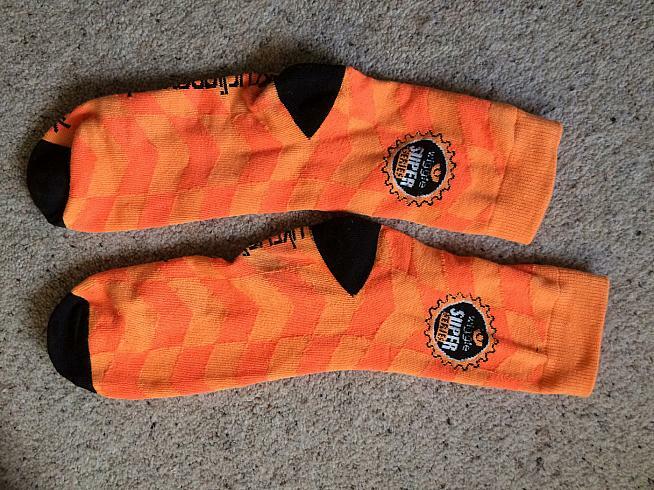 Stourbridge CC will be delighted with these orange socks.